Although technology has increased to levels that we never could have imagined, it has brought up threats to security and our identities. Our information is constantly being sent out over the internet, with promises that it is secure and completely safe. However, many large retail chains and banking establishments have been in the news lately with possibilities of information being leaked. This information in the wrong hands can lead to identity theft and illegal usage of our funds and our personal information. There are steps that can be done to prevent this from happening. Many establishments are responsible for hundreds and sometimes even thousands of people?s personal information. They are legally bound to properly dispose of this information in a timely manner, to prevent it falling into the wrong hands. These are establishments such as medical offices, restaurants and even health insurance providers. Doctors and health insurance providers are legally tasked with document shredding duties. Because their patients? and clients? information is so sensitive, state and federal laws dictate that all medical organizations have comprehensive date destruction plans. Even companies that are state and federally mandated should abide by these destruction plans to prevent any legal actions from a release of their client?s personal information. Shredding is one of the best ways to ensure that a customer?s data is disposed of completely. A document shredding company is a company that ensures that each piece of data is properly shredded. Simply passing a piece of paper through a generic shredder is sometimes not enough. It can, sometimes still be taped back together and the information is then compromised. Document shredding companies will provide the time and the effort that is necessary to ensure that proper shredding is completed thoroughly. Additionally, most paper that is sold in the world today is designed with ease of shredding. According to the Environmental Protection Agency, around 80% of the paper mills in the United States are specifically designed to use the paper that is collected in shredding and recycling programs. An additional benefit is that when a document is shredded, the paper is still able to be recycled and reused. This new document is also able to be just as easily shredded. 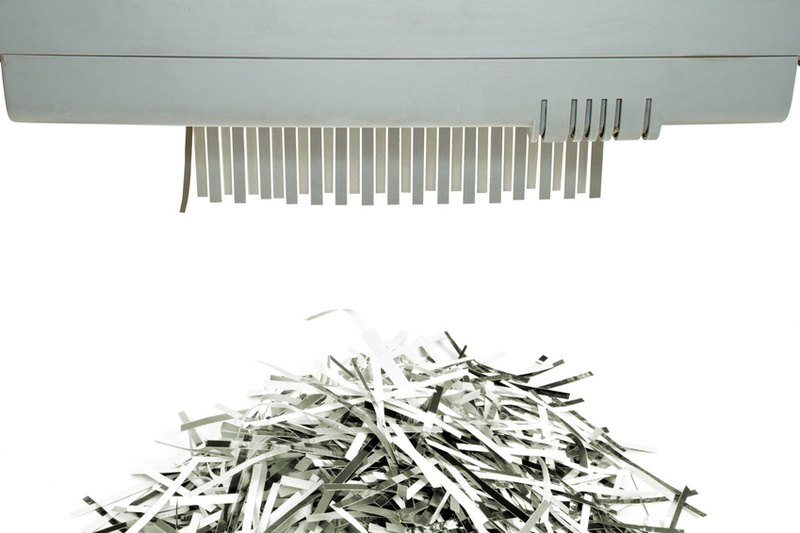 A document shredding company may not be enough to fully comply with customer security laws. It is also common that information may be stored in other forms. Although online exchanges represent less than 10% of identity theft cases, it is still a possible and a likely source of confidential customer information being released. Documents that are stored online should be stored in items that are available for hard drive destruction. When information is stored in a hard drive, the hard drive needs to be able to be destroyed to protect the customer?s information. Additionally, a document storage company can ensure proper security of customer?s information and files. Some companies may feel hesitant to hand over their customer?s information to a document shredding company. They may be worried about the credentials of that document shredding company and may also worry about their client?s data leaving the secureness of their office. Many companies offer the service of on site shredding services, allowing all of your client?s information to stay right in the office to be properly shredded. Identity theft has become a problem in the past few years. The increase of technology has also increased this problem. However, with the appropriate disposing skills, a company can be sure to abide by legal regulations and protect their customer?s important information. Many shredding companies will ensure that disposal is complete and proper, and many will even travel to your office, ensuring that your customers information is never compromised.